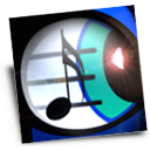 Today Neuratron released PhotoScore Ultimate 8, its latest version of the venerable music scanning and recognition software for Mac and Windows PCs. Integrated into the software is a desktop version of NotateMe, which the company says has already been downloaded on hundreds of thousands of devices around the world. Thus the new desktop product is officially known as PhotoScore & NotateMe Ultimate. Although that may be the case, the program doesn’t take full advantage of the high DPI of the Surface. Images are downsampled, making the music look rather fuzzy with jagged lines unless you zoom in at a high level. Hopefully this will be improved in time. There is a full screen option to get rid of the taskbars and menus so you can fill your entire screen with music. NotateMe on the desktop appears to be a straight port of mobile versions for Apple’s iOS and the Google Android OS, so if you already use the software on one of those devices, you’ll feel right at home with no learning curve. As noted earlier this week, the latest version of NotateMe offers different handwriting area options including an Overlaid option and a Bar by Bar option. These options are included in the desktop app, in NotateMe > Handwriting Area. As is has long been the case with PhotoScore files, you can send a NotateMe score directly to Sibelius from within the app. MusicXML and MIDI export are also included. PhotoScore & NotateMe Ultimate 8 is available for £199 in the UK, €269 in the Euro zone, and $249 USD in the US, Canada, Australia, and most other countries. A free demo is available, and current users of PhotoScore Ultimate may upgrade for $99 USD. Neuratron today also released PhotoScore & NotateMe Lite 8, a cut-down version of the software. A comparison table between the Ultimate and Lite version of the apps shows the differences. 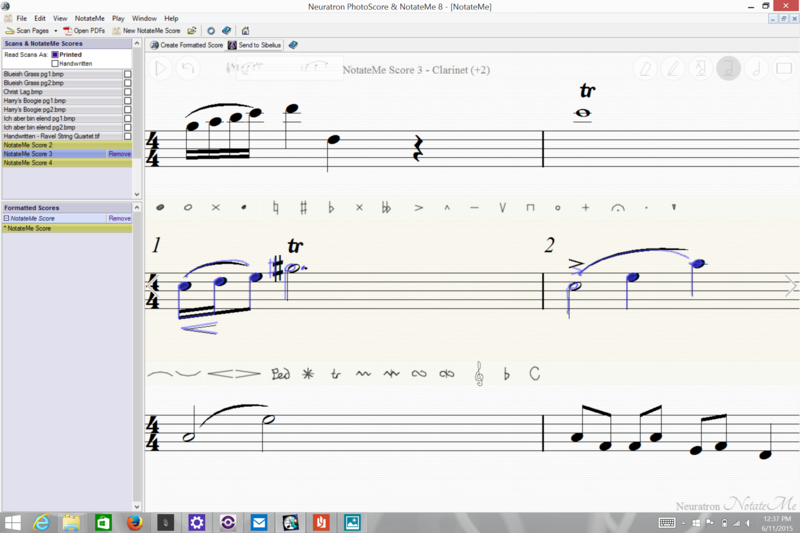 The Lite version is available for $59 USD, although users interested in purchasing this version may wish to hold off for now — Avid has said that PhotoScore & NotateMe Lite 8 will come bundled with Sibelius 8.0, which is expected to be released very soon. Pricing for AudioScore Ultimate 8 is the same as PhotoScore & NotateMe Ultimate 8. There is no Lite version of AudioScore. Yes, it would have been nice to have native resolution on the Microsoft Surface 3 at launch. But we’ve been pretty busy the past few months with all the combinations of different releases and needed to prioritise functionality. There’s a lot going on under the surface (no pun intended!) to allow PhotoScore NotateMe to work effectively with different combinations of stylus/finger/mouse. Certainly ultra HD display is on the list! Thanks, Martin! I’m glad to know it’s on the list. I had tried Photoscore’s (v. 7) demo before and found it worked quite well, definitely better than Smartscore. On that basis I bought the bundle that included both Photoscore and Audioscore. I should have tested Audioscore before deciding to buy it because I found in practice it made so many errors that it was essentially useless. I see that I can buy an upgrade to Photoscore 8 for $99 which I will probably do. But I’d like to know if Audioscore actually works reasonably well before spending the extra $50 to upgrade it also. There’s a free demo available from Neuratron.com. Additionally, you should find that if you already own both products, the additional price for AudioScore Ultimate 8 is currently on special offer for only $20. Please contact [email protected] who will be able to help. I have been using Photoscore since v.3 and for an educator – it is THE greatest asset to Sibelius and Arrange Style – awesome stuff Martin. We released a free patch yesterday to fix this issue (actually due to a bug in the way scans were stored in version 7). Please visit neuratron.com/upgrade and select v8.0.1. If you experience any further issues, please email [email protected]. Thanks, Martin. I have downloaded and installed v8.0.1 and it seems to be working correctly – at least on a scan. I will try a PDF next! Could you check if the Reduce Plugin bug has been fixed ? Tiago, I think you meant to comment in the Sibelius 8 thread. It does not appear that the Reduce plug-in memory buffer bug has been fixed in Sibelius 8.0. Sorry, Phillip. This Neuratron product is nowhere near ready for prime time. It scanned my original doc fairly well, but everything went downhill from there. Playback has no sound. It doesn’t understand that pickup measures don’t have their own time signatures. It was showing ‘bad notation’ errors on perfectly fine scans. Text interpretation was marginal, at best. Chord symbols were misplaced throughout the score. I could go on. I understand that I’m using a demo (thank gawd I didn’t pay for this! ), but you’d think that they’d at least allow the export of one page to Sibelius to see if there was any way to clean things up. Back to the drawing board, folks! Gregory, Please could you contact [email protected] – we should be able to help you. You should be able to export to the Sibelius Demo. Thanks for this very informative article, Philip. I was just wondering if anybody would be able to answer a few of my questions asap. I have downloaded the latest demo version of Photoscore Ultimate 8 and I have found it to be extremely accurate when scanning in sheet music, with very few mistakes, which often are related to the quality of the original sheet music. But, as it is a demo version, I am not allowed to save the document or import it to Sibelius. What I would like to know is how easy is it to import the scan from Photoscore to Sibelius and what is the quality like? I will be using it to arrange parts for a whole musical production, so scanning it in will save me a lot of time compared to inserting it manually. So I am looking at purchasing the programme in the next few days and I would like to know whether the programme works fully before making the purchase. Thanks in advance for your help. I have upragded Photoscore to 8 ultimate and to cut a long story short, nothing is working! It doesn’t open PDFs file, the reading has a million error and poor reading, the 5.5 was better. I have been spending hours on the last week tweeting with the resolution the twain …etc. with no luck. Moreover it keeps on crashing a lot…any help down here? Ihabr, please contact [email protected] who should be able to work out what is going wrong and assist you. Since working with Windows 7 and 8 (and Sibelius), every time I try out a new version of Photoscore, the results of scanning drectly printed or from existing PDFs get worse. My today’s a dozen trials with all possible preferences were devastanting. A 10-pages PDF of, let’say, medium quality resulteted with a salad of staves, stems and dynamic sings and no notes. Not to speak with all the program’s crashes, which could only be eliminated with the hepl of the Task Manage “close down program” system. With Neuratron 7 I was at least getting full notes, but the results needed hundreds of handmade corrections. Neuratron supplies an elaborate support list how to improve this or that, but with no positive effects. Why did this program work so well in the past (Windows XP)? I am the only one encountering this situation? By the way, I am also having similar bad results after having installed Photoscore on my iMac. I do not even dare trying out to have handwritten music read – after it does no even read printed music poperly. hadrianus, this sounds unusual. Please contact [email protected] – they should be able to help you make the most out of PhotoScore. As you see, the previous post in this thread is from a user encountering the same problems! As already mentioned, this happens since years I’ve switched over to Windows 7 and 8. With XP I never had troubles; I could scan more complicated orchestra score pages with very satisfactory results. I’ve also tried to scan a song with piano containing tuplet passages: with horrible results.The lyrics, however, come out rather good. PDF file scans are a real problem: directly printed score pages (scanned one by one) result better. I do not even try out handwritten music! In other words, as with PhotoScore’s last update (7), the money spent was for nothing. What is important to note is that you can’t get sucked into a discussion about ‘issues’ when it comes to software malfunction. This is what developers and vendors want. It shifts the discussion from the architecture of the product to the notion that all it takes is fixes to coding and things will be right again. In reality, the products are poorly architected, typical of most software programs written today: a linear coding routine designed to produce a logical result, command by command. Each section of code executes and produces some sort of result – wanted or not. ‘Fixes’ are desperate attempts to get all of these pieces to work with one another. Instead, if the code was written to inspect what the user sees and needs to work with, the application would realize right away that it is malfunctioning and you and I would never see it. Computer technology is the only industry I know of that can legally get away with foisting products on the public that do not function – fundamentally – the way they are marketed. Instrumentation of the applications is non-existent. ‘Error messages’ are nothing short than insulting to one’s intelligence. Until and unless we, the user community, insist upon quality and not dog-and-pony functionality, we’re going to be deluged with poorly-architected products. Bravissimo, Gregory! For the first time in my life I read such a sensationally clear and appropriate article about this situation. We are at the mercy of an often arrogant and “ebony tower”-like behavior of software developers; they really seem to live in another world. There are, for example, the “careless”, or “sloppy” ones, who enjoy launching frequent irritating or unusable updates, causing more complications than benefits – and often a lot of anger. Microsoft is the big winner: one gets the impression that they just don’t care about all the troubles their automatic updates can cause. They don’t respect those who buy their products and still make them rich – and should be in right to suggest and criticize. They are so convinced to know everything better. Microsoft’s last stupid and irritating Windows 7 and 8 versions, mainly conceived for tablet “finger players” and not for professionals (who need computers for serious work) are their biggest recent shame. And, as far as “old” Outlook is concerned, this is a program which should have been completely redone since years – and not always updated or made more complicated. Another “ebony tower” is Apple, a company who always launches updates or new system versions before they have seriously been tested – just because they count with learning from the feedback of critical users. In such cases, it’s the latter that should get paid, not Apple. Since a couple of years, Adobe (just to mention another “big one”) has also become daringly arrogant: they are switching over to cloud versions with a monetary rip-off attitude, which should deserve becoming object of a smashing court cause. And there are other developers, who sometimes leave the impression getting offended by receiving suggestions for improvements or new features. I was one of Switzerland’s first Sibelius users and follow this software’s history since a long time. I am a 71 years old composer-conductor and really like Sibelius; it has become a part of my creative life, it made it much easier. Before that I was working with a notation program called Notator on a tiny Apple computer. But to get professional feedback from Sibelius has become difficult after they were sold to Avid. In this case too, I am trying since over 10 years to suggest, among others, a new feature allowing manual clef scaling at clef changes’ places within single instrumental parts. No way: they promised many time that this feature would be considered to be included to new version. I did not dare yet to criticize Sibelius’ recent new working platform, a rather confusing thing for practical musicians. The program’s new windows, now subdivided and named with terminologies like “note input”, “notation”, “layout”, “appearance” and “view”, are, in my opinion, rather grotesque!